As usual, power consumption on this Sunday was the lowest of the week, and overall power generation fell to match that. On top of yesterday’s 8.4% fall, it dropped a further 5.5% today. The average for total generation from every source fell by 1200MW to an hourly average of 20800MW. While indicative of weekend power generation, compared to the highest day of power generation for the week, the Thursday, it was lower on this Sunday by 4500MW, a drop on this day compared to that one of 17.8%, a substantial fall. On this Sunday, as is always usual, the minimum power generation (the Base Load) was lower, and the evening peak was also lower. 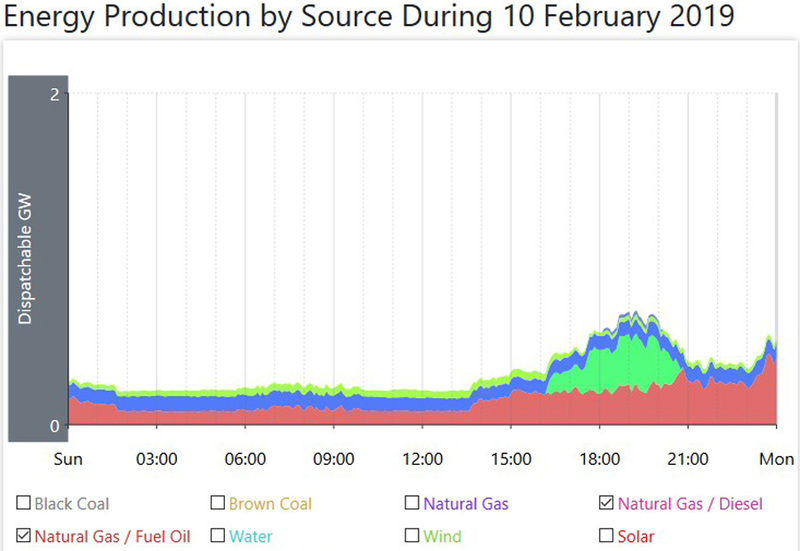 While the overall fell by such a large amount, every source but one (wind power) was higher on this day. The average for coal fired power rose by 370MW to an hourly average of 16610MW. No Units went off line, or came back on line on this day, so there are still 5 of those coal fired Units off line. The average for natural gas fired power was higher by 120MW. The average for those smaller Other sources was higher by 20MW. The average for hydro power was higher by 90MW, and hey, on the day of lowest power generation for the week, solar plant power has its best day for ages, up by a whopping 120MW to an hourly average of 560MW, but tempered by the fact that even at that high level of power generation, it was still only delivering 2.7% of what was required on the day. 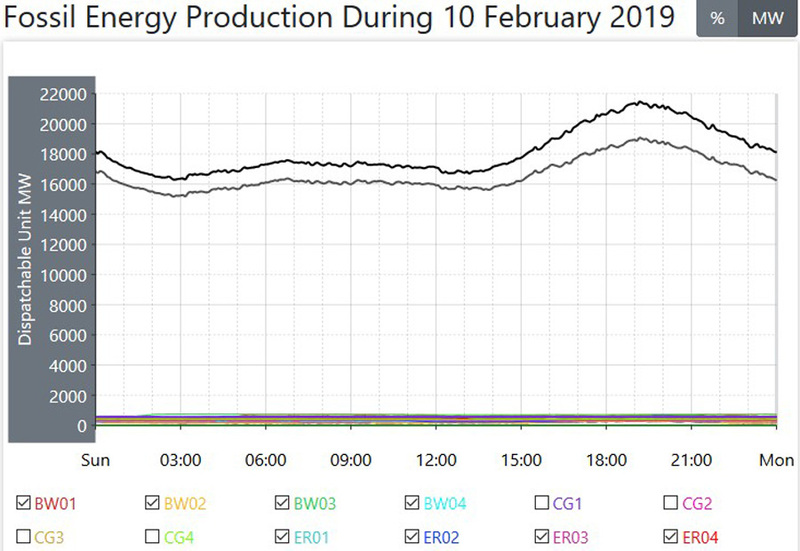 As I mentioned above, wind power had a poor day, well, a shocker really, way down from the high of yesterday, down to an average of 1020MW, a drop on the day of 1920MW, so you can see, that even when the overall fell by such a large amount, 1200MW, they still needed to make up 700MW from the other sources on the day. 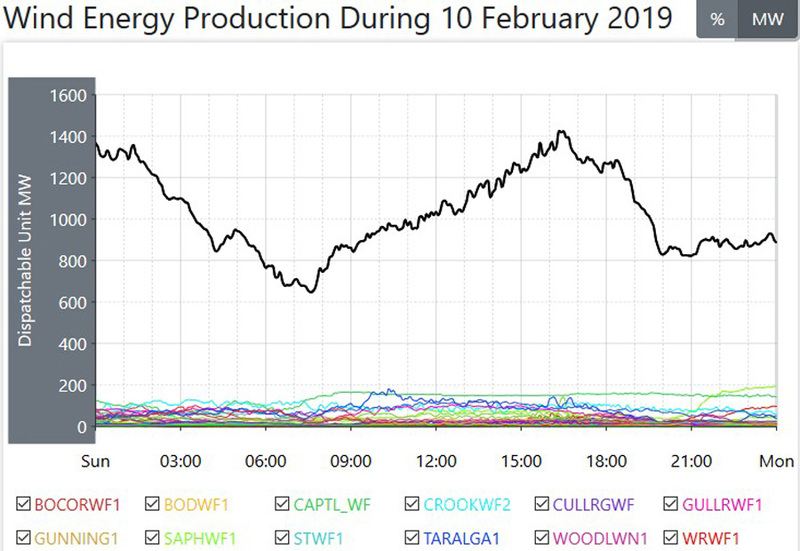 that average of 1020MW gave wind power a daily operational Capacity factor of 18.02%, well down not just on yesterday, but well lower than the year round average. 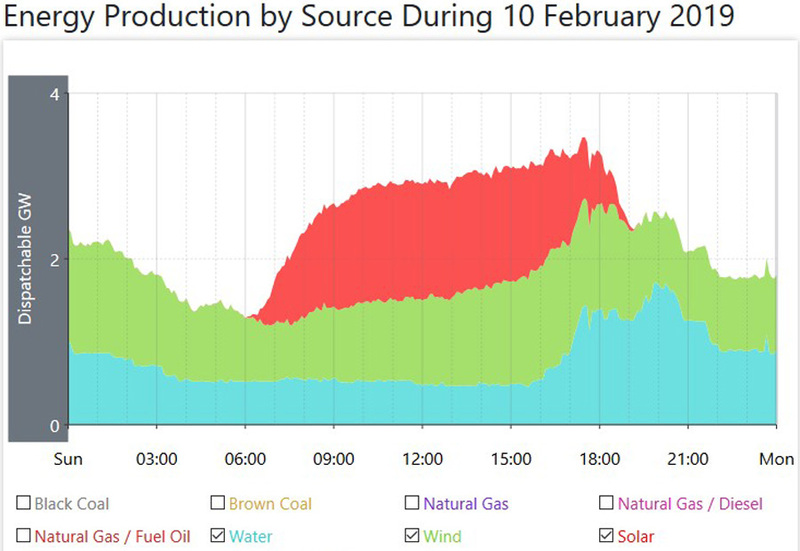 With the overall so much lower and coal fired power higher on the day, you can plainly see that coal fired power delivered just under 80% of all the required power on the day. WEEKLY DATA For Week Nineteen. Percent of total 73.33% 10.52% 1.68% 14.47% 4.35% 8.46% 1.66% 5.04%. That total power generation you see there of 3979.2GWH, (just under 4TWH) was lower this week than last week, however, only by 4.2%, which is still a pretty substantial amount. The highest minimum power generation for the week (the Base Load) was on Tuesday, when it was 19900MW and the highest maximum power generation (the Peak) of the week was on the Wednesday when it was 29900MW. 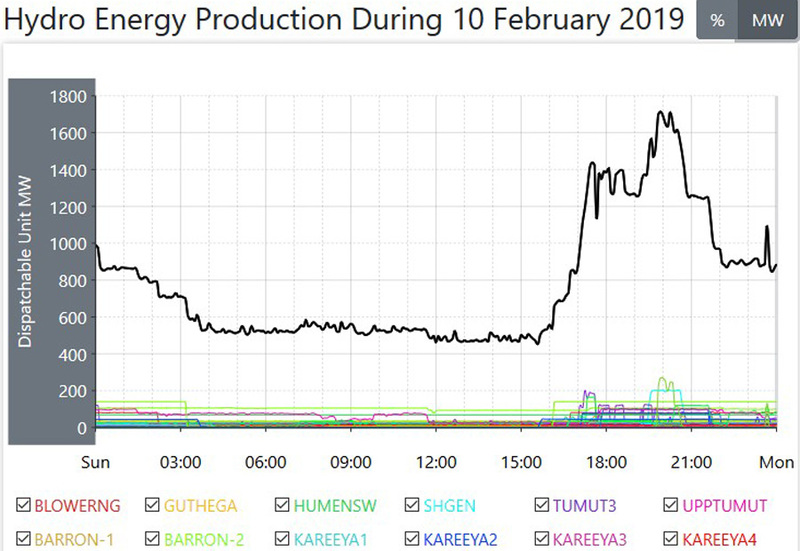 The day of the highest average power generation for the week was on Thursday, when it was 25300MW and the lowest for the week was, as is always the case, the Sunday, when it was 20800MW. That total for coal fired power (just under 3TWH) was higher this week than last week, so the proportional percentage of the total for coal fired power rose by 3.3% on the week. For this week, there were between two and five Units off line at any one time, so coal fired power, as is nearly always the case is pulling most of the weight when it comes to power delivery for the whole Nation in the Summer Months. That total for natural gas fired power was well lower this week than last week, so its proportional of the overall was down by almost 2%. 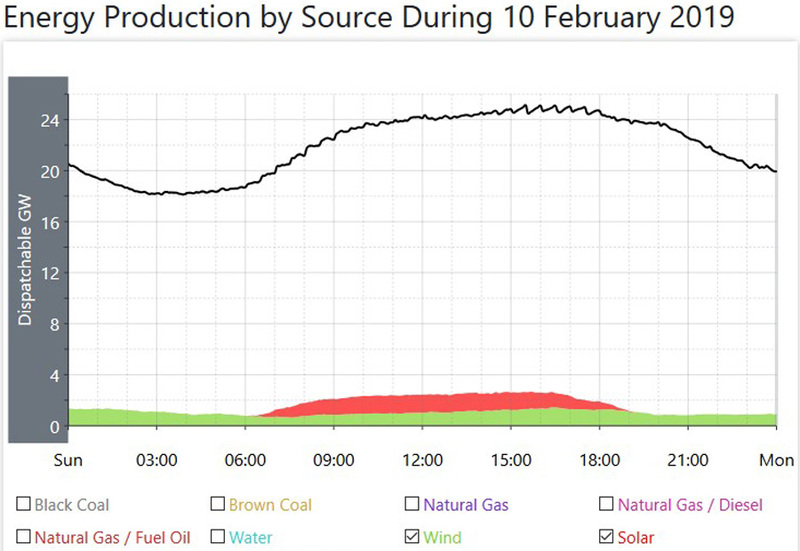 The power delivered by those smaller Other sources was also lower this week as well. 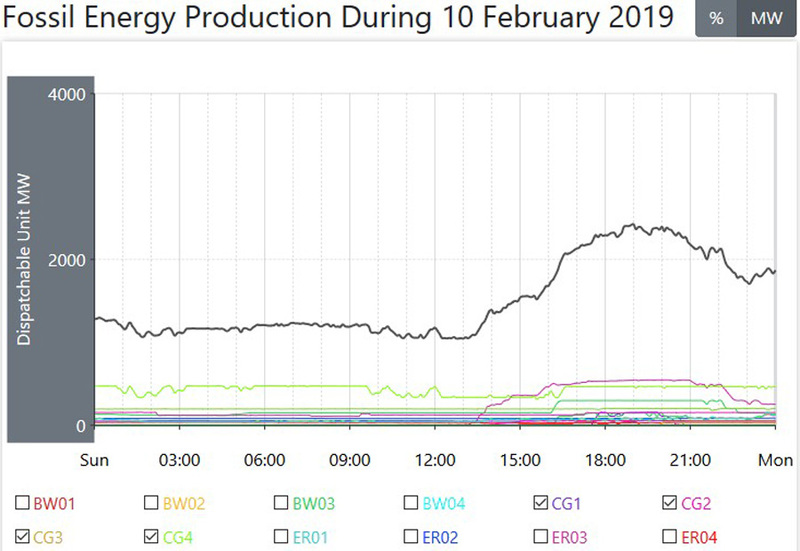 The total for renewable power was an interesting one to look at this week, because it was down by half a percent, despite wind power being so high. That was because hydro power was so much lower, down 2.5% on last week. 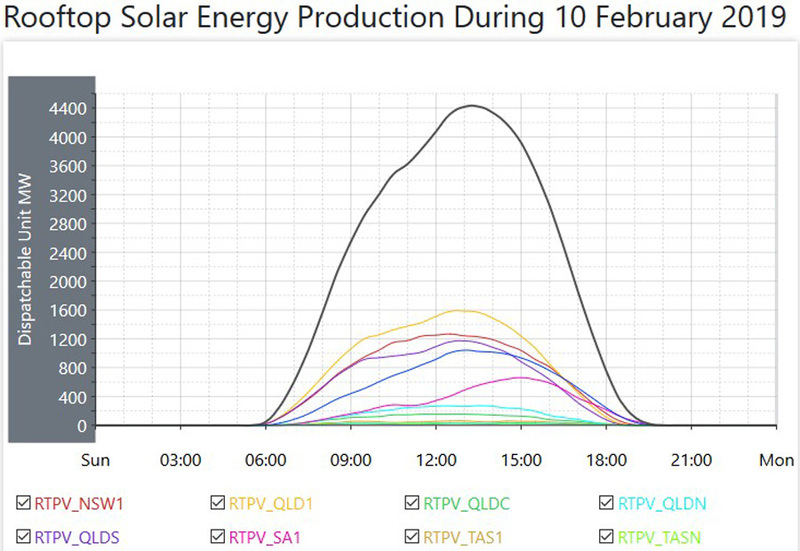 Both versions of solar power were also lower on the week, despite being the best time of the year for their power generation, showing that even at the best of times, they are hampered by forces outside of their control, clouds! As I mentioned, wind had a really good week, the best one for five weeks in fact, and its proportion of the overall was higher by 1.75%. That total power delivered from wind power, 336.48GWH gave wind power a weekly operational Capacity Factor of 35.36% and that’s well higher than the year round average of 30%. 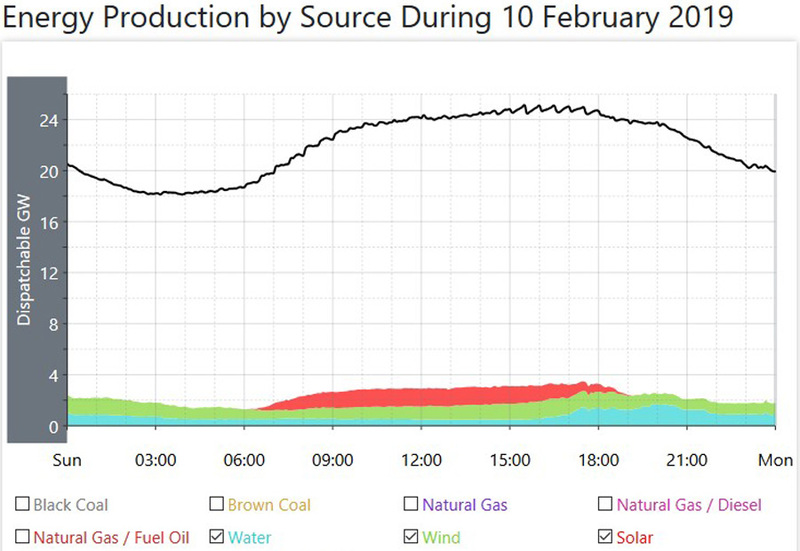 With the overall total from every source falling, and coal fired power rising, its’ obvious that coal fired power delivered a higher percentage of the total this week, and that was 73.33%, proving again, that when REAL power is required to run a Country, it can only come from that one source here in Australia, and that’s coal fired power. The totals have settled down now so that any changes are only minor in nature, and that was the case this week. That first Rolling Total, which is the power generated by power plants is on target for around 210TWH of power generated in a year. Other than for a couple of sources, those percentages of the total are only changing by the tiniest amounts now, barely in the hundredths of a percent. The only one which did change significantly was natural gas fired power, and even though the total power generated by natural gas fired plants was well down this last wee, that total was still well above the rolling average, so the percentage for natural gas fired power was higher by half a percent, pretty large considering we are at week 19, and all other sources are only changing by hundredths of a percent. 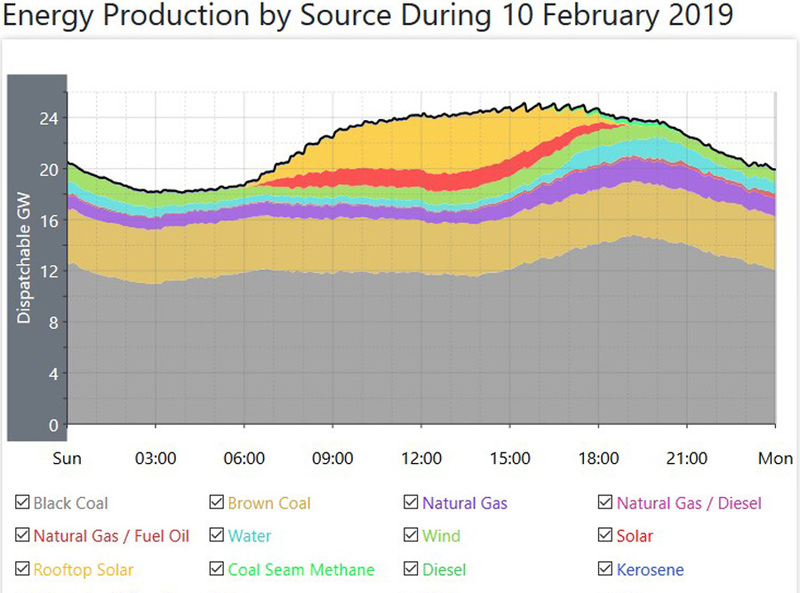 Despite wind power having a good week, its percentage of the total from every source only rose by 0.2%. That total power delivered from wind power of 5087.76GWH gives wind power an operational Capacity Factor after 19 weeks of 28.16%, a slight rise over last week, but still just under the year round average of 30%. 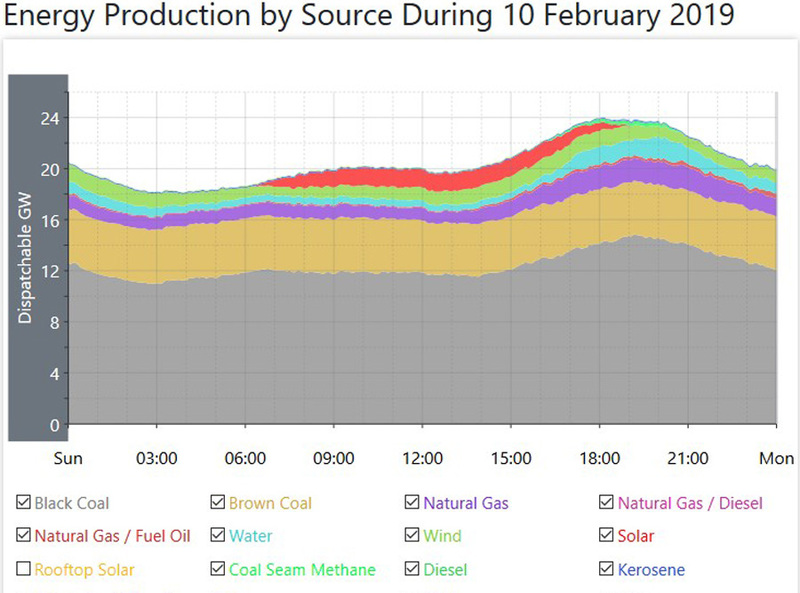 Note the total for all the renewables here, now right on 20%. However, take away hydro power, and the total from just those three sources of renewable most in favour, wind power and both versions of solar power still only come in at 13.5%. An important point to make here is that while that total is 13.5%, it has come at an enormous cost, measured in the hundreds of billions of dollars, and it still only manages 13.5%. Now, extrapolate that out to the promise from most State Governments that they plan to have 50% renewables by 2030, then with 13.5% now, they have to multiply the current existing total by a facot of 3.5 to reach that target, and if it has already cost hundreds of billions of dollars, then you can guess at the end total outlay in dollar terms. 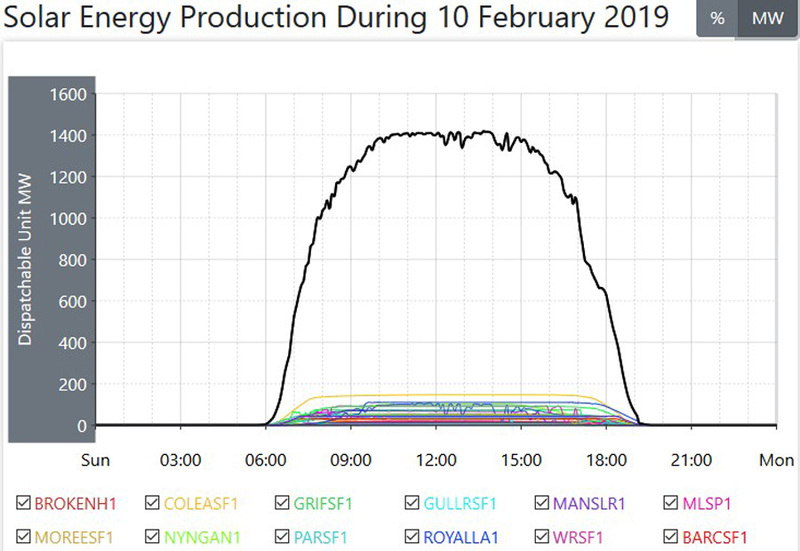 Coal fired power, even with the addition of rooftop solar power on that second Rolling Average is still at 70% of every watt of power being consumed in Australia.